Losing your virginity is rarely a comfortable or non-cringe inducing experience. Whether you waited for ‘the one,’ or just for your parents to leave the house for the evening, this is one rite of passage you’ll probably recall, fondly or otherwise, for many years to come. Of course, former child stars are no exception. Opening up during a very revealing interview with Anna Faris, Macaulay Culkin discussed his first ‘sticky’ initiation to bumping uglies. Look, I know Macaulay is now a 37-year-old adult who’s perfectly capable of being left home all by himself, but this adult-ness is still weird for any of us who remember him as Richie Rich. It was warm and sticky and I thought like, ‘Geez, This is weird. Am I doing it right?’ And also we listened to The White Album so there you go. In a nutshell, like, ‘Am I doing it right? This is really warm and sticky. So many new smells, what’s going on?’ So yes that was me losing my virginity at 15. I was about 15, so I think that would be the youngest I’d be okay with that. I’m with a lady right now and she is so good to me that they feel like blows. She just does nice things and I feel like, at first, I didn’t know how to be treated well in that kind of way. It was a strange, almost foreign concept. 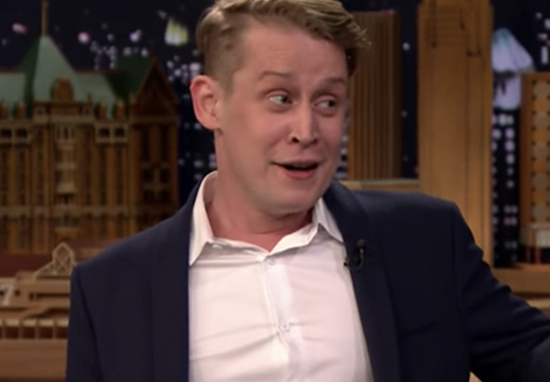 Macaulay’s good sense of humour, in the face of many an internet death rumour, has gained him plenty of new fans; 28 years on from his most famous movie Home Alone. Like many of us, the road to love has not always been easy for the actor. Culkin married Penny Dreadful actress Rachel Miner back in 1998 when he was just 18-years-old, divorcing after four years. He later dated Family Guy star Mila Kunis from 2002 to 2011, when they split on reportedly amicable terms. Since October 2017, he’s been romantically linked with 29-year-old Disney actress Brenda Song. The pair have previously been spotted looking loved up and happy on a festive Paris getaway. Unlike his film counterpart, Mac was able to catch the flight to Paris and spend his time dining out rather than catching crooks through questionably violent means. It’s so nice to see the formerly troubled star looking so relaxed and healthy. All the best of luck to Macaulay and Brenda!